The assessment of cough has been hampered by the lack of objective tools. The Leicester cough monitor (LCM) is a validated cough monitor that records 24-h cough frequency. The LCM is a lightweight, ambulatory and automated system that consists of a recorder and a microphone. The aim of this study was to use this novel tool to evaluate cough frequency in an outpatient setting. We recruited 84 patients with chronic cough from our specialist cough clinic (50 women, mean age 55 years) and recorded their 24-h cough frequency. This was compared with subjective parameters of cough severity (visual analogue score (VAS) and quality of life scores (Leicester cough questionnaire, LCQ)). The responsiveness of the LCM was assessed in 21 patients who underwent a 2-week trial of oral prednisolone. Patients with chronic cough had a mean (SEM) cough frequency of 16 (2) coughs/h. All patients had diurnal variation in cough frequency (21 daytime vs 10 nighttime coughs/h; 95% CI for difference 7 to 15; p<0.001). There was no relationship between cough frequency and age, gender, duration of cough, atopy, meal times or cause of cough. There was a significant correlation between cough frequency and both cough symptoms (VAS; r = 0.37; p<0.001) and quality of life (LCQ; r = −0.41; p<0.001). 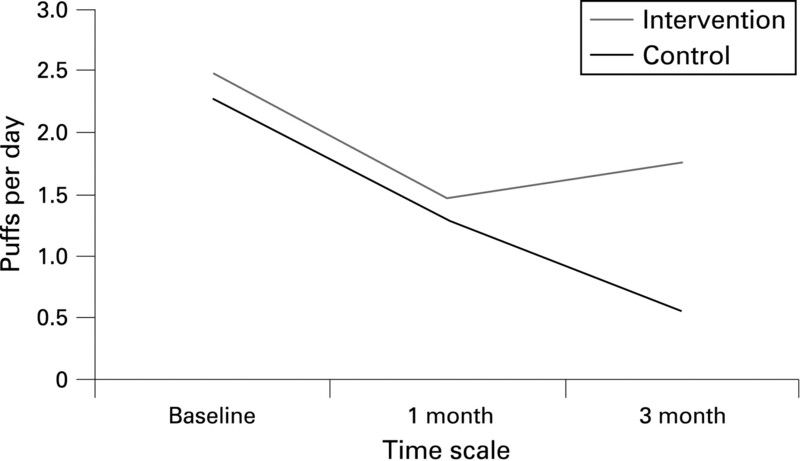 A reduction in cough frequency was seen in 17 (81%) patients undergoing a trial of prednisolone. The responsiveness of the LCM was good; the effect size for change in cough frequency (difference in mean cough frequency/standard deviation of baseline cough frequency) was 0.6. This is the first study to report cough frequency using an automated cough monitor in a clinical setting. The LCM represents a significant advance in the assessment of cough severity. We have demonstrated that the LCM is a reliable, well tolerated and easy to use objective cough monitor. It should be a useful tool to assess patients with cough in the clinic and clinical trials and to assess the response to therapy. Rationale: Patients presenting with unexplained chronic cough undergo a range of diagnostic testing. Patients with bronchial hyperresponsiveness to methacholine (BHR) are often considered to have cough variant asthma (CVA) as a potential cause. Methods: In a prospective study, 100 patients attending a tertiary referral clinic (mean age 57 years (SD ± 11.0), 65% female, median cough duration 3.8 years (interquartile range 2.0–10.0)) underwent a detailed diagnostic protocol including pulmonary function testing (flow volume loop), BHR to methacholine, induced sputum cell count and bronchoscopy. 84% of patients had previous failed trials of asthma treatment (inhaled and/or oral steroids), 26% were currently taking inhaled corticosteroids (ICS) but still coughing. A potential diagnosis of CVA was determined by the presence of BHR with raised eosinophils (>3% in sputum or lavage) and eosinophilic bronchitis (EB) by raised eosinophils in the absence of BHR. Results: Eight subjects had evidence of CVA (median PD20 0.55 mg/ml (range 0.07–2.08)) and 10 EB. A third of subjects had BHR in the absence of eosinophils (median PD20 1.96 mg/ml (0.20–5.56)) but 13 were currently treated with ICS. Pulmonary function (FEV1) was lowest in the group with BHR alone (93.9% ± 14.3) compared with CVA (106.6 ± 11.1), EB (103.2 ± 16.0) and no BHR or eosinophils (108.2 ± 13.8) (analysis of variance p⩽0.001). Small airway flow rates were also lowest in the BHR alone group (logFEF25 (p = 0.007), logFEF50 (p<0.001) and logFEF75 (p<0.001)) (see fig). Conclusions: BHR in the absence of other evidence of asthma is common in tertiary referral patients with chronic cough. These subjects had poorer pulmonary function than patients with CVA or those with normal methacholine reactivity. Background: Experimental induction of cough is an important tool in the evaluation of the reflex. Commonly used tussive agents include capsaicin, citric acid and distilled water. Capsaicin induces cough by acting on TRPV-1 receptors. TRPA-1 receptors, another member of the same family, have a similar property of being activated by environmental chemical stimuli (chemesthesis). Cinnamaldehyde, the active ingredient of cinnamon, is a specific agonist of this receptor. We wanted to evaluate cinnamaldehyde as a tussive agent as our hypothesis was that it would stimulate the TRPA-1 receptors in the airways and induce cough. We also wanted to determine whether previous inhalation with cinnamaldehyde would affect cough reflex sensitivity to capsaicin or citric acid. Methods: In a randomised crossover study we performed two cough challenges at one hour intervals in 10 healthy non-smoking adults with nebulised cinnamaldehyde, capsaicin and citric acid using a validated technique (MB3 MEFAR dosimeter). We also performed cough challenges with capsaicin and citric acid following the previous inhalation of subthreshold cinnamaldehyde (or diluent). Results: A total of 10 subjects were included in the study (6 men, mean age 33.5 years). All subjects had normal lung function tests. C2 and C5 are the concentration at which two or more and five or more coughs, respectively, were induced. All three agents induced cough, which was reproducible at 1 h. The median C2 and C5 are shown in the table. Cough challenges were well tolerated with all the agents and a trend towards tachyphylaxis seen with all. Previous inhalation of cinnamaldehyde (or diluent) did not have any effect on subsequent cough challenges with citric acid or capsaicin. Conclusion: TRPA-1 receptors allow for complex binding with other receptors and mediators. The extracts of a number of naturally occurring pungent compounds such as cinnamon (cinnamaldehyde), mustard oil (allyl isothiocyanate) and wood smoke (acrolein) stimulate these receptors. We have demonstrated that inhalation of nebulised cinnamaldehyde experimentally induces cough. TRPA-1 seem to be a major site for chemesthesis in the airways and important in the evaluation of the cough reflex. Rationale: Cough is an important symptom in asthma. This study was designed to investigate the factors that predict objective cough rates in asthma. Methods: 56 non-smoking adults with physician-diagnosed asthma underwent 24-h ambulatory cough recording (mean age 41.5 ± 13.6 years; 34 (60.7%) female; median asthma duration 16.5 years (range 2–58); BTS step 1: 41.1%; step 2: 32.1%; step 3: 14.3%; step 4: 5.4%; step 5: 7.1%). Median FEV1 percentage predicted 93.9% (range 27.9–126.5); median feNO 28.6 ppb (5.9–186.0); median DRR to methacholine 99.6 (range 3.36–1625.3) no steroids 23 (41.1%); inhaled steroids 29 (58.1%); systemic steroids 4 (7.1%). Recordings were manually counted using cough seconds as an estimation of time spent coughing. The concentration of citric acid eliciting two (C2) and five (C5) coughs was used as a measure of cough reflex sensitivity. Results: 24-h cough rates were low (median 2.6 coughs/h (range 0.0–14.2)), with more coughing by day (median 3.9 coughs/h (0.0–18.5)) than by night (median 0.4 coughs/h (0.0–8.7)) (p<0.001). Women coughed more at night than men (0.6 coughs/h versus 0.1 coughs/h (p = 0.01)) but not by day (p = 0.12). There was a weak but significant positive correlation between overall cough rates and age (r = 0.36, p = 0.006). LogC2 correlated inversely with daytime cough rates (r = −0.39; p = 0.03) but not LogC5 (r = −0.08; p = 0.65). Cough rates did not correlate with feNO (p = 0.63), DRR (p = 0.81) or FEV1 (p = 0.68), nor did they differ between BTS grade (p = 0.46) or between those taking and not taking steroids (p = 0.52). Conclusions: Cough in asthma is independent of standard measures of asthma. Increasing age and lower C2 were predictive of higher cough rates and female asthmatics cough more at night than men. Rationale: Gastro-oesophageal reflux is reportedly associated with between 5% and 40% of cases of chronic cough, but the mechanisms linking cough and reflux are not well understood. The aim of this study was to investigate the relationships between measures of micro-aspiration, reflux and cough in these patients. Methods: Simultaneous 24 h oesophageal impedance/pH and cough monitoring were carried out on 78 chronic cough patients presenting to a specialist clinic. Pepsin quantification was performed in sputum and bronchoalveolar lavage (BAL) samples using a plate ELISA, based on a mono-specific antibody to porcine pepsin. 12 BAL samples from healthy controls were used for comparison. Results: The mean number of reflux events in 24 h was within the normal range (64 (±23); 29 patients (37%) had reflux disease (>73 episodes/24 h)). Median 24-h cough rate was 10.4 coughs/h (range 0.3–70.2). There was no significant difference in median BAL pepsin concentrations in cough patients and controls (18.2 ng/ml (range 0–56.4) and 9.3 ng/ml (range 0–46.9), respectively, p = 0.27) or in cough patients with and without reflux (p = 0.34). The median sputum pepsin concentration in cough patients was 17.3 ng/ml (range 0–55.4), with a trend towards higher concentrations in those with reflux (p = 0.07). Using multiple linear regression and correcting for the effects of age and gender, cough rate was significantly related to the number of reflux episodes (p<0.001). Using a similar model cough rate was also predicted by sputum pepsin (p = 0.002) but BAL pepsin in this model was not significant (p = 0.20). The slope of this relationship was negative, indicating that patients with higher cough rates had less pepsin in their sputum. Conclusions: Despite physiological levels of reflux in the majority of patients, cough rates were significantly predicted by the number of reflux events. Pepsin concentrations did not support a role for micro-aspiration in chronic cough, rather subjects with higher cough rates had less sputum pepsin, suggesting that cough may protect from micro-aspiration or clear pepsin from the proximal airways. Reflux appears to be a trigger for cough, but micro-aspiration does not appear to occur. An abnormal oesophageal sensitivity to physiological levels of reflux may be present, explaining the low sputum pepsin levels. Background: Gastro-oesophageal reflux has been implicated in the pathogenesis of a significant proportion of patients with chronic non-specific cough. Guidelines on the management of chronic cough suggest a therapeutic trial of anti-reflux medications. Esomeprazole at a dose of 20 mg twice daily is a proton pump inhibitor (PPI) licensed for the long-term treatment of reflux in adults. We wanted to evaluate the effects of treatment with esomeprazole on chronic cough. Method: This was a prospective, single-centre, randomised, double-blind, placebo-controlled, parallel design trial conducted over 8 weeks. 50 adult (>18 years) patients who were non-smokers and had chronic non-specific cough (>3 months duration) were randomly assigned into this trial. All patients had a normal spirometry. Patients completed a Leicester cough questionnaire (LCQ), a validated cough-related quality of life questionnaire, at the beginning and at the end of the study. The LCQ scores varied from 3–21 with higher scores representing better quality of life. Subjective self-assessment cough score from 0–9 (cough score) and a similar score for symptoms of gastro-oesophageal reflux (reflux score) were obtained at baseline and at the end of the study. Citric acid cough challenge and a laryngoscopic examination (obtaining a reflux finding score (RFS)) were performed at baseline and the end of the study. The primary outcome of the study was improvement in cough. Results: 15 men and 23 women with a mean age of 56.8 years completed the study. Their mean duration of cough was 5 years. The treatment and placebo groups were comparable. There was a significant improvement in the reflux score seen in patients on the treatment arm (p = 0.03). There was no significant improvement either in the cough score, LCQ or in the RFS in the treatment arm as compared with placebo. Conclusion: PPI are suggested as first line treatment in patients with chronic cough which is possibly caused by extra oesophageal reflux. Our results show that treatment with a PPI ameliorates symptoms of “heart burn”, the characteristic feature of gastro-oesophageal reflux. No differences in symptoms of cough were observed on treatment with a PPI.